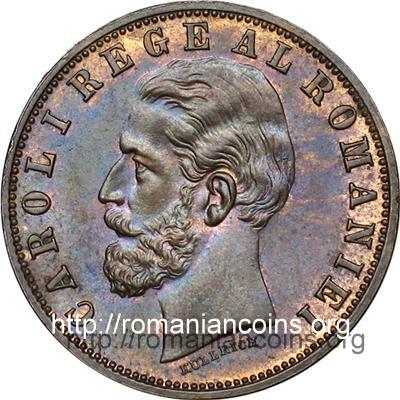 denomination "5 BANI", year 1882, Romanian coat of arms, letter B and wheat ear, the signs of Romanian mint, outer pearl circle inscription "CAROL I REGE AL ROMANIEI" meaning "KING OF ROMANIA" and CAROL I head facing left, outer pearl circle. 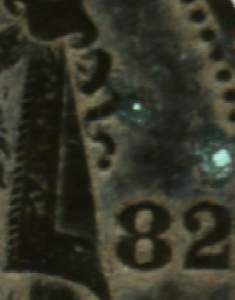 Under the neck lies KULLRICH, the engraver's name. 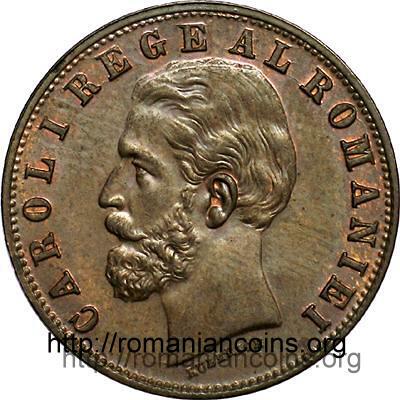 Mintage: 1882 - 5.000.000 coins, 1883 - 3.000.000 coins, 1884 - 8.400.000 coins, 1885 - 3.600.000 coins. 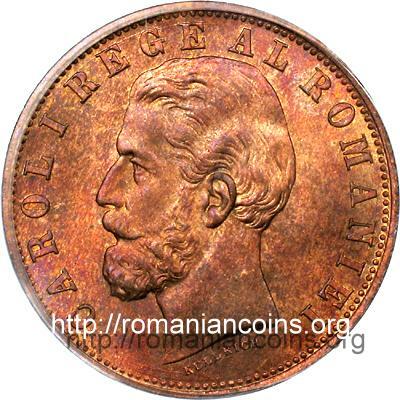 The 5 bani 1882, 1883, 1884 and 1885 coins pictures above are present on Romanian coins through the kind permission of an anonymous donor. 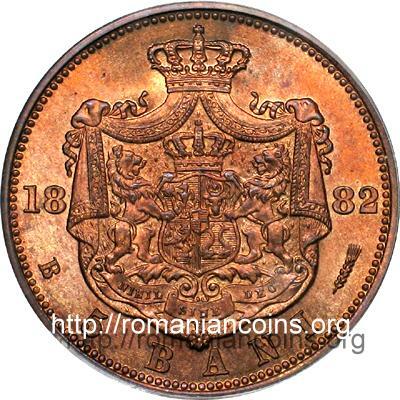 The pictures of the 5 bani 1884 (one fold) coin above appears on the site thanks to the kind permission of Mr Radu Lissner. 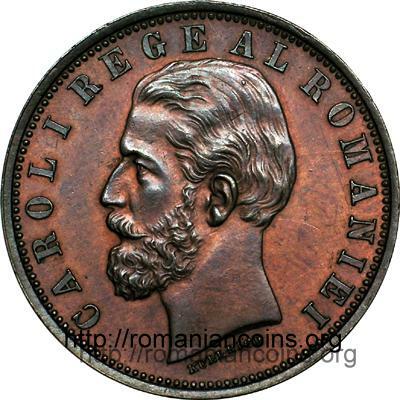 We also thanks to Mr Cristian Ciuplea and to Mr C.P. 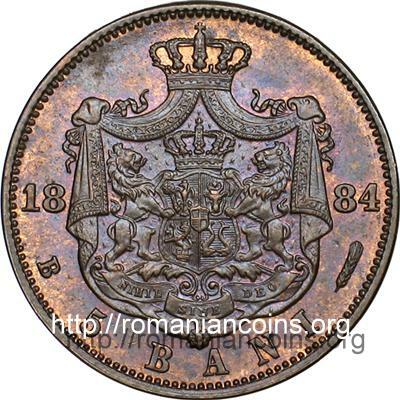 On this 5 bani series the purple pavilion lined with ermine fur from the Romanian coat of arms was represented in two variants. 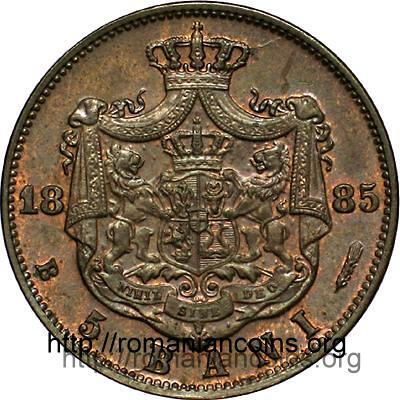 On 1882 and 1883 coins (and maybe on some 1884 coins) the pavilion has only one fold - variant named in the monograph Monede şi bancnote româneşti "one fold at the curtain". 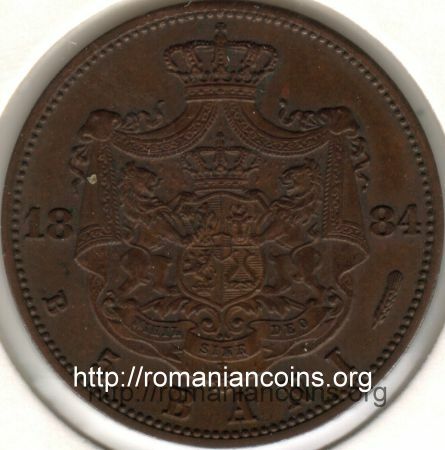 On the 1884 and 1885 coins the pavilion has two folds. 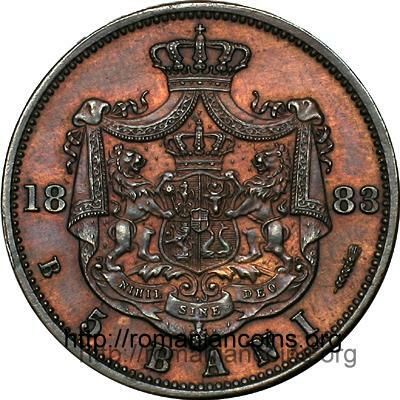 Coins from 1884 without the engraver name also exist (we don't know the number of folds on this variant). 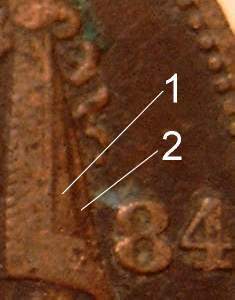 In the detailed pictures below the two situations are presented.